David Coax has pondered for years where his infatuation with old abandoned rotting automobiles has come from. Some of his earliest memories are of running across hill and dale in search of an old abandoned junkyard. Well, as you can see behind me, my artwork isn't exactly the stereo typical work that most automotive artists employ. Where do you yourself see the biggest difference? Well I don't strictly consider myself an automotive artist. It's a niche I fell into about twenty years ago when I moved to Germany and was looking for a 'motif' to study painting. I had done a lot of drawings and sculptures up to that point and had been using oils prior to moving here to Germany. I wanted to try acrylics and it just happened that I needed a subject. 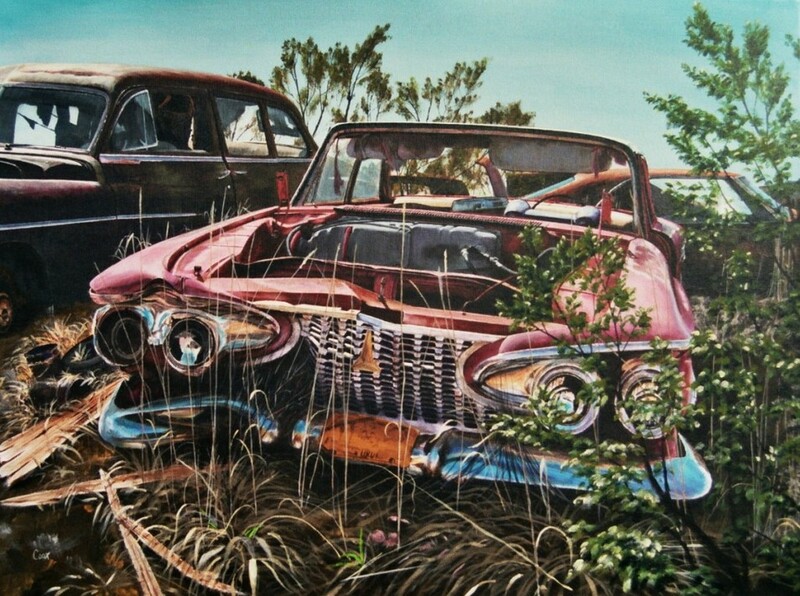 I had all these photo's from old abandoned cars and started painting them in their settings. I used to play in some of those cars when I was a boy. So I just fell into that 'motif' and then I started exhibiting at classic auto shows. And we even started a club of half a dozen members and exhibited together. Is that a club in Germany? 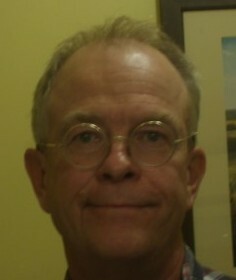 Yes, Klaus Wagger was a member at the time. It was about a decade ago. Not really. It still exists on paper but it just wasn't cost effective for the artists. I can't really pinpoint just what it is that captures my emotions when I see an old vehicle which has been left behind a barn rotting. 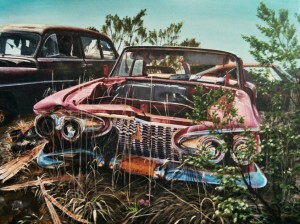 Does painting old abandoned cars bring back memories from the US. You don't see that many American cars in Germany. It brings back the sense of my own home, my longing. Even as a young boy, I've always found intrigue in these vehicles and the fact that they were just left out there. Was it the vehicle itself or the fact that it was left out there? I don't know Marcel. This is something I've pondered over for years myself and have tried to rationalize my endeavours here. Some of my earliest memories are that I was infatuated with old rotting automobiles. As a five year old, I was running across hill and dale in search of an old abandoned junkyard. I would ride by on a school bus every day and would see this old junk yard. It was a few kilometres from my home. I just left the house and didn't tell my parents. Once I was travelling through this one field and it was so wet and muddy that my boots were sinking into the mud and getting stuck. My feet were coming out of my boots. This gives you a sense of the strong urge I had to explore these old vehicles. So I've never really been able to explain it. The example I use in my website is that I compare it to an icon that represents a certain romantic emotion which it evokes in me. Much the same way Wordsworth or Samuel Taylor Coleridge were inspired by old castle ruins and abbeys. I kind of see these icons as a romantic representation of our past. Man was given the freedom of being able to travel with these vehicles. And it was most likely the first car that somebody had ever owned in their life. Right but even before that, they gave the common man a sense of mobility that he never had. If he had a horse, he was lucky but most didn't until the automobile and industrial age gave the common man this ability to own and have this mobility. I think it represents a period of history that was very new to the common person. So your art also captures the heritage; an historic document for the future? That's the best I can explain it. I can't really pinpoint just what it is that captures my emotions when I see an old vehicle which has been left behind a barn rotting. When you are painting and going through the process, what happens to you emotionally? It depends. If I get a feeling that this is the subject I want to paint, then from there it's more mechanical. I know what I am doing to the end point but it's the feeling that I get before I start. The inspiration. I need something to inspire me. You already mentioned you have a lot of photos of cars and places, do you go through them and pick one? Or do you compile what you see into one final artwork? Sometimes I paint verbatim. Other times I build a particular background and put in a car or something else which may not have belonged there. Over the years when I paint a customers' car, I've offered to put in whatever background they want. So I've become accustomed to making a montage. There is quite a contrast between your free work and your commissioned work. It's a world of difference. Yes it's hard to be enthusiastic when you are painting someone else's notion. Are you then more restricted to the car owner and the background? Yes. I like to do my own work and not so much the commission work. So how did you get started with your technique. Did you go to art school? Back in the States, family would often ask me as a boy what I wanted to be when I grew up. I remember the first thing I wanted to be was a farmer, and then I wanted to be a Policeman. But one day, when I was around 12 years old, I had just finished a drawing, I thought to myself 'I am an artist'. I didn't say I want to be an artist; in my head I just thought 'I AM an artist'. And here's the irony, I had just drawn a 57 Chevy Bel Air. That's how I got started. I've always been artistically inclined. Did you then take art lessons? I went to high school and took all the art I could. I also took mechanical and architectural drawing, which I think gave me a real sense of how pieces break down and the perspective. It really trained my eye and I did the exploding drawings etc. You still did everything by hand in those days with ink. So it was a lot of practising to get the shapes and dimensions right etc. Yes. I took art classes and continued but when I first entered the university, I wanted to be an architect. Then I dropped out for a period and then went back in. My website clarifies that I took my Bachelors in English Literature. So I took my art classes at the same time. I was surprised that you did literature as a study. Is there a relationship between literature and painting? I think history shows that they are always in step with one another. The visual arts and literature have always been linked together. Personally I wanted to have something which would give me a little more set of skills, where I might be hired for more jobs and a bigger range of occupations. I was afraid that doing the visual arts, I wouldn't be able to make enough for a living. Did you start writing yourself then? I also had aspirations in that area but I've never really developed them in the same way I have my visual arts and sculptures. I've worked a lot with stone work too over the years. What were the topics of your sculptures? Well let me show you. 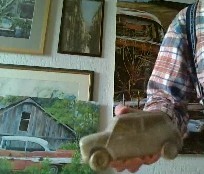 David got up and got one of his sculptures he had made out of soap stone, a mini car. Mainly I do vases, chest pieces, dolphins and things of that nature. Not typically cars. I did it just to enhance my exhibits at the car shows. Does it need to be figurative for you David or do you experiment in other areas? I have real difficulty getting away from realism. I don't know why exactly because I would like to be more impressionistic. But for some reason, I have this tendency to be a perfectionist and as hard as I try, I want things to look as they should, I guess. I have difficulty in loosening it up. So when you create an artwork, are you painting it for yourself or for your audience. Not so much. I pretty much paint it for myself. And what kind of reactions do you get at shows when you are exhibiting your work? If praise were currency Marcel, I'd be a very rich man. David laughs. You live in Germany showing American cars. Do people ask where the Mercedes and BMW's are? I've been told many times that if I were to concentrate on those areas, I would do very well for myself. I did a Mercedes in a garage earlier on and I showed it in Stuttgart no less. I had a number of people who wanted to buy the original immediately and I hadn't even photographed it at the time. I sold it for what seemed to me to be a good price, only to find out later that I could have made much much more. The only photographs I had of it were just from a 35mm camera and although I was able to create a set of prints from that, they weren't as fine as they could have been. They also couldn't be enlargened. So I kind of learned a lesson the hard way there. But still you did not move to German cars then? No I need that inspiration. I'm too stubborn to paint what the people want. I will still do commission work though. For new and upcoming artists, what kind of advice would you give them to develop themselves and their techniques. I always tell real beginners that they want to start in the background and work forward and put everything in the foreground on top of what is in the background. That helps to give it more of a sense of depth and perspective. Is there any artwork on your bucket list that is something you still want to create or paint? That means you are satisfied with what you have done so far. Oh yes. I'm not complaining by any means. If I never sell anything ever again, I will not be disappointed. I'd like to get rid of the stuff though, so I have room for more. Empty walls inspire me to paint. I'm very happy with what I have achieved and there's nothing looming there in the future which I wish I had done. 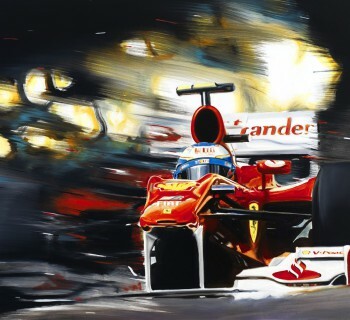 Where do you see the position of automotive art in the regular art world. Well I've seen a lot of good automotive art. It's not just illustration. I enjoy Klaus Waggers' work but I've also seen Nicholas Watts work and Alfredo Del La Maria from Argentina. These are just a couple of examples of what I think is real art. These paintings have feeling to them. A sense of capturing an emotion or a scene. 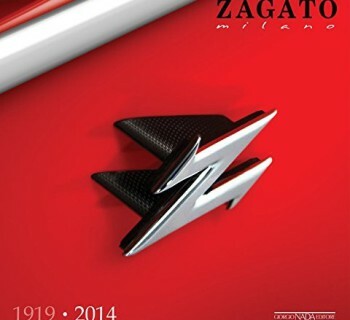 It really makes you want to be there or know what's going on beyond just looking at a particular car of a certain year. And still they are also struggling to have their work seen as fine art. Well I definitely think my work represents art. It's not just an illustration of a car. Well I grant you it might not be avant garde. Or really shocking, bringing out hidden emotions which some artwork proposes to do. But at least I don't go 'Well what the heck is it'. Sorry I'm pretty opinionated but I sometimes really wonder what some people think when it comes to art. David will be exhibiting his work at the AHOY in Rotterdam (EuroArtFair) on 14-15 November, 2015. To see more of David's work, please visit David Coax website.